The swiss chard still flourishes along with the kale, the cabbages, the arugula. The nights are cold but no killing frost yet. The cold nights only enrich the flavors. 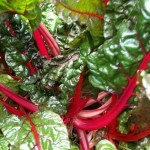 And swiss chard — as I’ve written before — is another superfood with nutrients supreme. Plus as the recipe below proves, it’s beautiful too. I don’t know where I found this recipe but I’ve been making it for years. Roast the beets in a 400 degree oven until tender about 1 hour. Cool. Peel and cut into cubes. Trim the stalks off the chard and chop into pieces crosswise. Cut the leaves coarsely into 1 inch strips crosswise. Heat olive oil in a large pan over medium heat. Add the garlic, then the onions until beginning to soften. Add the sliced stalks, saute about 10 minutes. Add the chiles, the drained tomatoes and 1 cup of raisins. Simmer until vegetables are soft, stirring on occasionally, about 15 minutes. Add chopped chard leaves and stir to wilt. Remove from heat, stir in lime juice. Season to taste with salt and pepper. 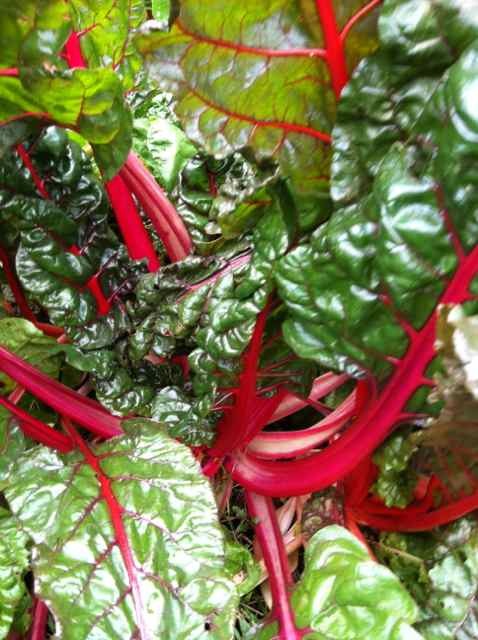 Transfer chard mixture to a large platter or serving dish. Sprinkle with beets, goat cheese, pine nuts and 2 tablespoons raisins. Not only delicious, this dish is quite beautiful when you use colored beets to complement the rainbow chard stalks. This entry was posted in superfoods, swiss chard. Bookmark the permalink.